Learn more about LC Foods chocolate low carb sweet snacks to buy online. And find out how to get keto baked goods delivered right to your door! 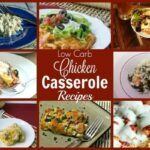 Are you looking for low carb baked goods online? LC Foods offers freshly baked sweet snacks for low carb diets. 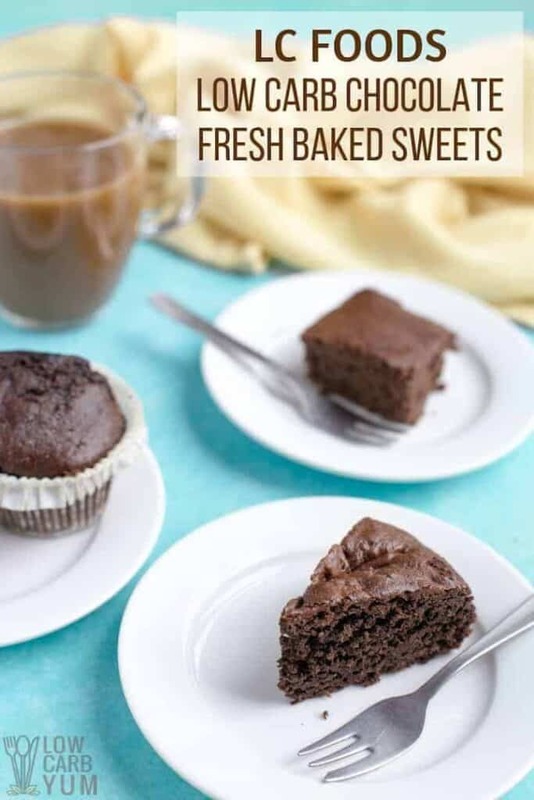 These low carb muffins, keto cakes, and other low carb fresh baked sweets are shipped fresh without ever being frozen. Because they are freshly baked, the treats do need to be placed in the refrigerator or freezer when they arrive. So if not consuming within 3-4 weeks, they should be placed in the freezer where they can be stored long term. LC Foods has been serving the low carb and diabetic communities for over ten years. And they’ve been one of my favorite online spots to buy ingredients for my recipes over the years. I recently received a few of the newly improved chocolate baked goods from LC Foods to sample. You’ll find out more about these products and what I thought about them in this review. Have a celebration coming up, but don’t want to take the time to bake a low carb cake from scratch? 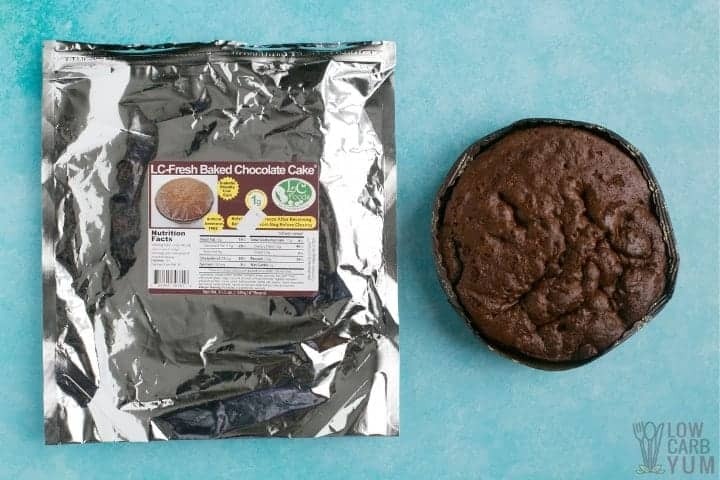 The LC Foods fresh baked low carb gluten free chocolate cake is perfect for any occasion. And you can buy it way ahead of time and store it in the freezer until ready to use. The single layer cake comes in a 6-inch round pan and it’s enough to serve 8 people. But the best part is that each slice has only 1.2g net carbs making it a great keto-friendly option! The cake does come unfrosted, but you can easily add a low carb chocolate buttercream frosting for more decadence. Or a homemade keto peanut butter frosting like the one used in my chocolate peanut butter cake can be used. Simple toppings like a little dusting of cocoa powder, a sprinkling of finely chopped sugar free chocolate chips, or a small amount of unsweetened toasted coconut chips are great too. Another option is to drizzle on a glaze made with powdered sweetener and water. However, there’s really no need to add anything to the cake. It’s really delicious by itself. And the texture is soft and moist. 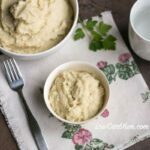 It’s definitely a winner if you don’t want to take the time to make your own homemade low carb cake or need something quick for a last minute get together. Curious about the ingredients? You’ll find the full product label with nutritional data and ingredients on the LC Foods chocolate cake product listing under the Nutrition/Instructions tab. The low carb chocolate muffins by LC Foods are a delicious breakfast alternative or low carb snack. If you like fresh baked muffins, the treat can be warmed in a 300°F oven before serving. And it comes in an oven safe baking pan that can be used to bake them all together if desired. 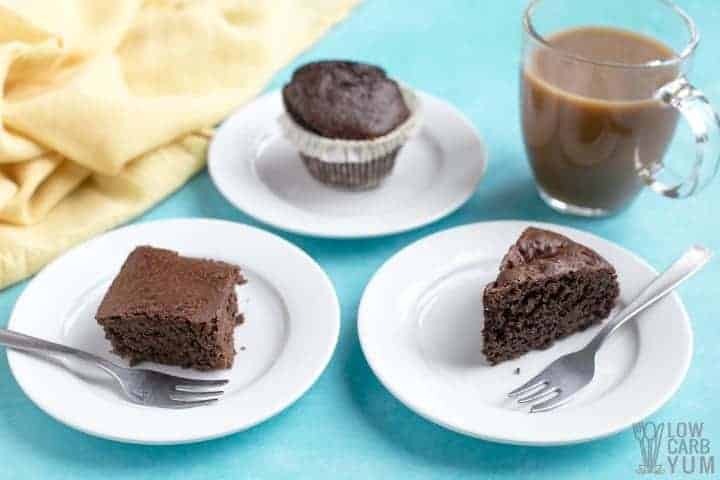 Like the chocolate cake, the muffins have a soft moist texture just like high carb muffins. But there’s no sugar or gluten which makes it a much healthier choice. I found the taste to be a little less sweet than the cake. And a little frosting or glaze could be added to make it a more decadent dessert. The muffins are made with a blend of almond flour and coconut flour. There’s also some flax meal added. Sweeteners used are inulin, stevia, and monk fruit so there’s no sugar alcohol used. Only natural ingredients are used and there’s no preservatives. Although not a high protein treat, each muffin has 6.5 grams of protein. And there’s 19.6 grams of fat with only 2.5 grams net carbs so the macros are keto friendly too. 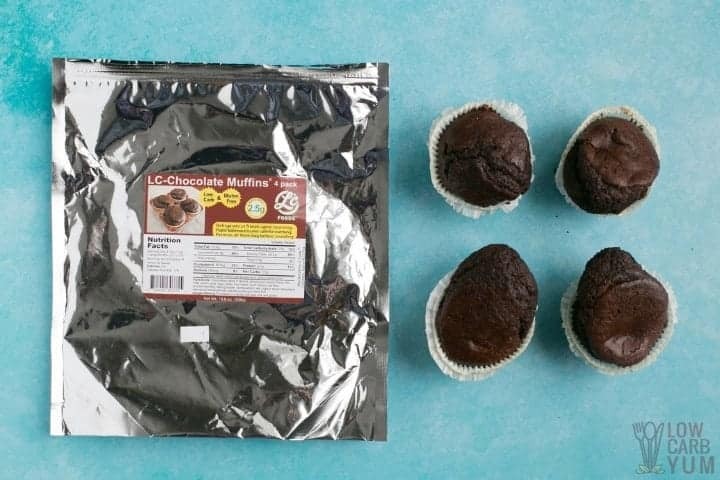 You can see the full details on these delicious chocolate keto muffins on the LC Foods product page. Not only are the Nutrition facts and ingredients listed, but an image of the product label is available too. With only 1 gram of net carb each, the LC Foods chocolate brownies are perfect for a quick keto snack. They come in a 7×5-inch pan that serves 12 people so it makes a nice take along to special occasions or gatherings with friends. Like the muffins, they can be placed in a 300°F oven and served warm. This makes it a wonderful base for a low carb hot fudge brownie sundae. 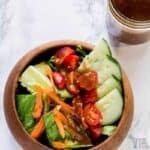 Just add a scoop of vanilla keto ice cream, low carb hot fudge sauce, and some whipped cream. The ingredients used are similar to both the cake and muffins. But it’s got more of a cake-like brownie texture. And like the other chocolate baked goods, it’s sweetened with a blend of stevia and monk fruit along with some inulin. 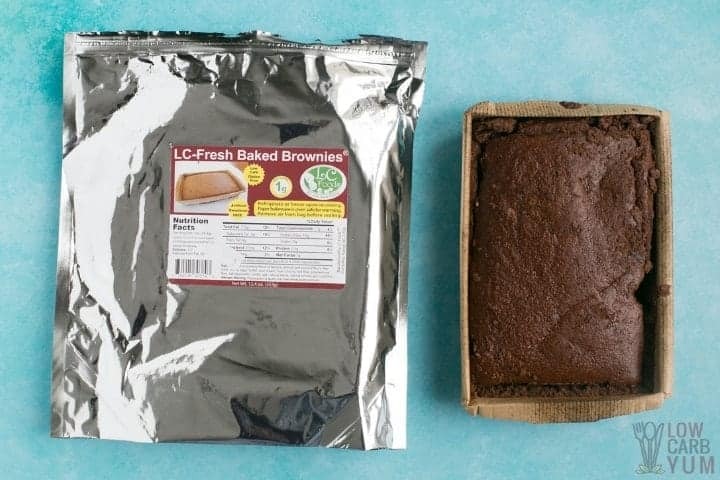 To learn more about these tasty brownies, head over to the LC Foods online store and check out the product page. 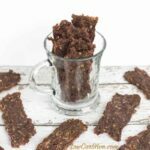 You won’t find these delicious low carb sweet snacks in local grocery stores. They are available in the LC Foods online store. So give them a try if you are looking for convenient low carb chocolate baked goods to satisfy your sweet tooth. And while you’re there, be sure to check out all the other fresh baked products like low carb breads and bagels! Are all of these Gluten Free as well? My husband is celiac and I have to be careful when bringing things into the house that he might want to eat, lol. They all look amazing, though! LC Foods offers excellent choices. Definitely check them out, especially if you are in the US.